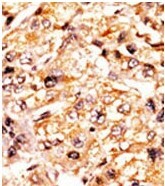 This antibody is generated from rabbits immunized with a KLH conjugated synthetic phosphopeptide corresponding to amino acid residues surrounding S975 of human Rb-like 1. RB-like 1 is similar in sequence and possibly function to the product of the retinoblastoma 1 (RB1) gene. The RB1 gene product is a tumor suppressor protein that appears to be involved in cell cycle regulation, as it is phosphorylated in the S to M phase transition and is dephosphorylated in the G1 phase of the cell cycle. Both the RB1 protein and RB-like 1 can form a complex with adenovirus E1A protein and SV40 large T-antigen, with the SV40 large T-antigen binding only to the unphosphorylated form of each protein. In addition, both proteins can inhibit the transcription of cell cycle genes containing E2F binding sites in their promoters. Due to the sequence and biochemical similarities with the RB1 protein, it is thought that RB-like 1 may also be a tumor suppressor. Rodier, G., et al., J. Cell Biol. 168(1):55-66 (2005). Barbie, T.U., et al., Proc. Natl. Acad. Sci. U.S.A. 100(26):15601-15606 (2003). Joaquin, M., et al., J. Biol. Chem. 278(45):44255-44264 (2003). Cicchillitti, L., et al., J. Biol. Chem. 278(21):19509-19517 (2003). Leng, X., et al., Mol. Cell. Biol. 22(7):2242-2254 (2002). Store the antibody undiluted at 2-8°C for one month or (in aliquots) at -20°C for longer. Protein G Affinity Chromatography. Then, the antibody fraction is peptide affinity purified in a 2-step procedure with control and phosphorylated peptides. The phospho-specific antibody is eluted with high and low pH buffers and neutralized immediately, followed by dialysis against PBS. PBS with 0.09% (W/V) Sodium Azide as preservative. 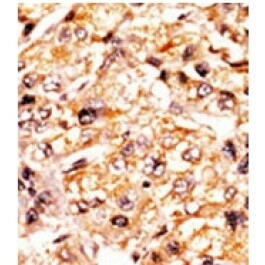 This antibody detects Rb-like-1 pSer975.